Apple ships a number of very nice screen savers with OS X—you’ll find them all in the Desktop & Screen Saver preference pane. Some of the screen savers, such as Beach and Cosmos, consist of gorgeous images that appear in sequence, fading and sliding into and out of view. But what if you want to use a screen-saver image as your desktop background? Here’s how. Open a Finder window (Command-N) and navigate to your user folder /Pictures. Then open another Finder window and navigate to /System/Library/Screen Savers. The system’s screen savers are in this folder. Hiding in some of the screen savers are images you can liberate for your own use. Specifically, the following ones contain usable desktop images: Beach, Cosmos, Forest, Nature Patterns, and Paper Shadow. I’ll use the Beach screen saver as an example, but these instructions also apply to the others. Control-click on Beach.slideSaver, and choose Show Package Contents from the contextual menu. When the new window opens, navigate to Contents/Resources, and voilá—there are the images! Beachy Keen It’s easy to use any of the Apple-provided screen-saver images as new desktop backgrounds. Here, I’m hanging out on the beach and enjoying the view. The next steps are simple. Decide which images you want to borrow (or press Command-A to select them all), and then drag and drop them into your open your user folder /Pictures folder. Close that folder, open the Desktop & Screen Saver preference pane again, click on the Desktop tab, and select your Pictures folder in the source list. Click on the image you want, and it will appear as your desktop image. OS X’s Application Switcher provides a handy way to jump between applications. Just press Command-tab, and a row of icons appears on your screen. These icons represent currently running applications, and they are displayed in order of most- to least-recent usage. While continuing to hold down the Command key, press tab to cycle through them. When you reach the one you want, release the keys, and that program will leap to the foreground. 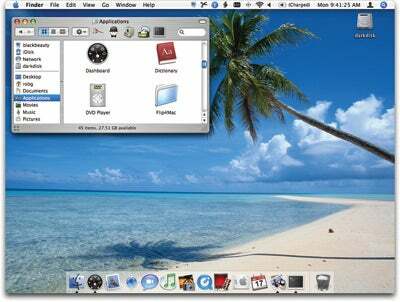 We covered some Application Switcher tricks in the July 2005 Mac OS X Hints , but we haven’t discussed how you can use dragging and dropping with it. Say you want to drag and drop something into a TextEdit document, but you’ve hidden TextEdit so you can’t see its open windows. No problem! Start dragging the object you want to drop, press Command-tab to activate the switcher, and then tab over to TextEdit (while holding down the mouse button, so you don’t cancel your drag operation). Release Command-tab when TextEdit is highlighted, and it will activate and unhide. Now you can drop the item into your open TextEdit document. But wait—consider the previous example. Only this time, after unhiding TextEdit, you discover that you don’t have an open document window on screen to accept your dragged item. You might think you’ve got to cancel your drag operation, create a new document in TextEdit, and then start the process again. But that’s not the case. After you switch to TextEdit (that is, after you’ve released Command-tab and are still holding your item with the mouse), just press Command-N to create a new window. Even though you’re in the middle of a drag operation, TextEdit will receive the command. You’re not limited to opening new documents with this trick—you can use any application’s other keyboard shortcuts while you’re dragging, too. But this works only if you’ve switched to the application via the Application Switcher (or by using Exposé). Note that you can’t drag and drop an object directly onto an application’s icon in the Application Switcher—you have to first activate the destination application and then drop your dragged object. If you’d like to drag and drop directly onto Application Switcher icons, you might try Proteron’s $15 LiteSwitch X 2.6 ( ), which provides that useful feature and others. I use the Finder’s search feature (by pressing Command-F in the Finder) more often than full-blown Spotlight searching (accessed by pressing Command-spacebar). As long as I’m relatively specific about what I’m looking for, the Finder quickly produces results that are usually relevant. But with Spotlight searching, you can do something that doesn’t seem possible with the Finder: sort and group search results in a meaningful way. A Nice Sort The Finder’s search feature (Command-F) can give you more sorting options for search results. Just press Command-J to open the View Options dialog box. There is, however, a way to sort and group (in a somewhat limited matter) the Finder’s search results. Run your search; then select View -> Show View Options (or just press Command-J). This will bring up the Finder’s View Options dialog box, with some additional settings specific to the search results window. Here you can group by Kind or Date, and sort by Name, Date, or Kind. These options aren’t quite as powerful as the grouping and sorting options offered in the Spotlight results window, but they’re a good start. With iPhoto 6 (part of the $79 iLife ’06), Apple quietly removed a feature from the program—the .Mac HomePage button. This button let .Mac subscribers automatically create online photo albums from an album or a selection of pictures in iPhoto. True, the new iWeb program (also part of the iLife ’06 suite) has an integrated photo-page feature. But iWeb is more than many users need. The simplicity of the old HomePage button was hard to beat. Photo Albums in a Snap In previous versions of iPhoto, one button connected you to .Mac’s very easy-to-use HomePage tool. In iPhoto 6, that button is gone, but you can still publish a quick online photo album if you know the trick. My solution is not quite as simple as clicking on a button, but I think it’s easier than creating a full site with iWeb. In iPhoto 6, select the photos (or album) that you want to turn into a .Mac photo page. Choose File: Export. Set the Scale Images No Larger Than fields to 800 x 600 or 640 x 480, as you wish (larger images will take longer to upload and use more .Mac disk space). Make sure that the Use Extension option is selected—if the image names don’t have extensions, then the .Mac site won’t let you use them in an image page. Click on Export. In the dialog box that appears, click on your iDisk in the sidebar, and then click on the Pictures folder. This is where .Mac stores the pictures used in photo pages. Click on New Folder, name the new folder, and click on Create. Click on OK to export the images. That’s all you have to do to export the photos. Next, log in to .Mac to create your new photo page. 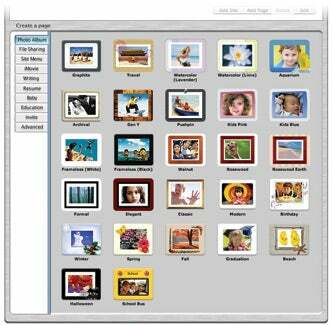 Click on the My Pages link and select one of the Photo Album styles. When the next screen appears, select (by clicking once) the folder of images you just created; then click on Choose. Fill in the captions and descriptive text and click on Publish—then you’re done.